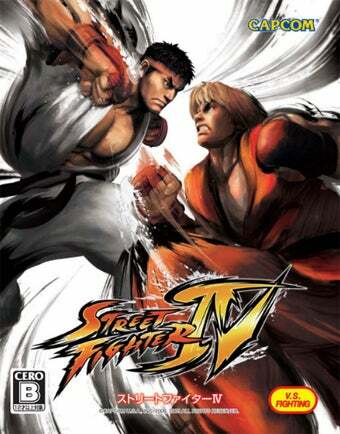 Twenty-two years after the first installment of the game hit arcades, Capcom releases the latest and possibly greatest version of the fighting game that kick-started the genre with Street Fighter IV. Capcom isn't one to pull out a new number without meaning it, and they definitely mean it with Street Fighter IV. The game is updated with a bold new 3D look while maintaining the 2D gameplay we've come to know and love; new characters join a cast of returning favorites; and the gameplay mechanics have been tweaked without completely changing the way the game has always been played. It's a formula for success, but the proof is in the pudding. Let's see what the assembled game critics make of Street Fighter IV. You'll see two fighters, one on each side of the screen. Best of three rounds. An array of six buttons lets you do three different types of punches and kicks, and combining these buttons with a variety of preset joystick motions lets you execute special moves - fireballs, lightning kicks, all that. As you get better, you learn to chain moves together in unblockable combos. Other fighting games have taken these simple concepts and added layer upon layer of complexity. Street Fighter IV pulls back on this a bit in an attempt to make the game more palatable for casual players. What's here is a wonderful mix of old and new. Street Fighter IV's 25-person roster includes series mainstays Ryu, Chun-Li, Ken and Blanka, as well as newcomers El Fuerte, Crimson Viper and the overweight Rufus. No matter whom you choose, the combat is immediately accessible and addictive. Veterans will perform trademark moves with ease, while gamers that abandoned Street Fighter years ago will find that Street Fighter IV fits like a comfy pair of slippers; if you dominated fools as Ryu in the '90s, he'll feel instantly familiar. Meanwhile, newcomers can execute devastating attacks, either by mashing buttons or learning the nuances of combat in the Training mode. Additional characters contribute some depth, but most of Street Fighter IV's longevity comes from its rock solid mechanics. The controls feel fluid and responsive on the analog sticks, whether you're executing a precisely timed combo or pulling off a Shoryuken. If you're more of a button-masher (or have never played the series before), SF IV is an excellent place to hone your skills. A set of character-specific training challenges start out by teaching you basic moves, but you'll soon graduate into more complicated techniques like combos and cancels. I particularly like the addition of focus attacks, which are essentially strategic counters that figure into many advanced maneuvers. If there's one gripe I can find with this title-and believe me, it's exactly one-it's the issue of the game's unlockable content. This is a fundamental problem not exclusive to this game, and it centers around the fact that the audience for Street Fighter is much older than it used to be. Sure, there are new gamers, young and old, being welcomed to the fold each and every day, but this game was meant to get back a lot of the older players that the genre had left behind. The option to allow other players around the world to challenge you while you're playing through the arcade mode is both ingenious and exquisitely implemented. It mimics the arcade experience exactly, breaking into the flow of your progression, taking you out to play against a human competitor, allowing you to play rematches against them and finally, when you're all done, reinserting you into the single-player game where you left off. Our only criticism of the set-up is the inability to switch the option off mid-game (it has to be turned off on the start screen). It's taken us more than an hour to progress through a single arcade run on occasion, simply because of the sheer number of new challenger interruptions.